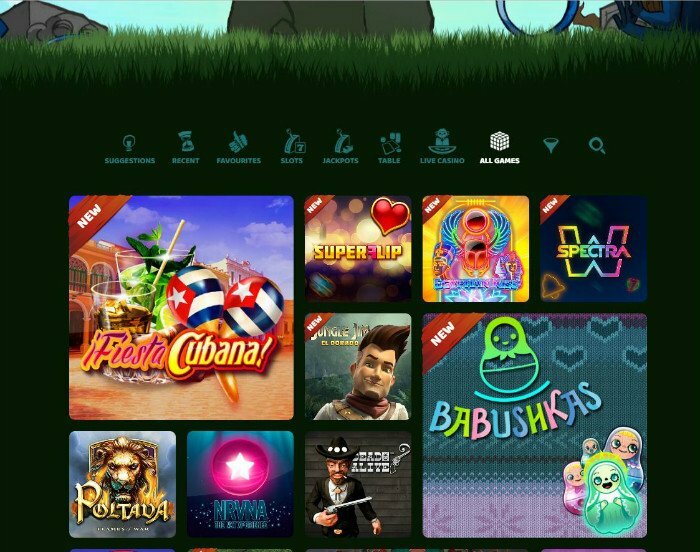 Ikibu casino greets you with a new design and an impressive collection of games produced by 8 leading software developers. Win a fortune playing progressive jackpot games and cash out your profits using a plethora of payment methods. Ikibu Casino is one of the few that actually tell a story, in addition to offering countless games to its members. It invites them to enter the fictional world of Ikibu, an archipelago formed by volcanic island and surrounded by reefs. Players are supposed to explore the environment and the creatures inhabiting it, while moving from one game to the other. The developers have put a lot of effort into creating a consistent and coherent story that can get players immersed into this wondrous world. Players from certain countries are not allowed to open a real money account, while others are not eligible for bonuses. You won’t be able to claim bonuses if you live in Spain, France, Italy, USA, Poland, Russia, Ukraine, Belarus, Bulgaria, Croatia, Czech Republic, Estonia, Greece, Slovakia, Slovenia, Serbia, Latvia, Lithuania, Macedonia, Moldova, Bosnia and Herzegovina, Albania, Hungary, Austria and Romania. Ikibu online casino is powered by 8 of the leading software developers. Microgaming, NetEnt, Play’n Go, NYX provide most of the games while the rest are supplied by Thunderkick, Elk Studios and NextGen. The result is a broad selection of games that is comparable to what the leading online casinos can offer today. Slot machines happen to be the most numerous ones, but players have the option of quickly switching to live casino games. Blackjack, baccarat and other table games can be played here straight in the browser or downloaded on computers and mobile devices. Ikibu Casino games are audited for fairness and the payout table can be seen on the website. Keep in mind that this is still a new gambling operator, so more games could be added to their collection in a not so distant future. The official release of Ikibu Casino happened in the second half of 2016, so this is one of the newest gambling operators. They were quick adopters of mobile technologies and all those who gamble here will be able to play video slots on smartphones and tablets. You don’t need the latest device to run the games and bonuses have the same eligibility requirements across all gambling devices. The number of Ikibu Casino bonuses and promotions is relatively low, but this is the result of the casino opening its doors recently. What they lack in numbers, they compensate through quality and originality. Players receive cash prizes, spins, but also seeds which act as loyalty points and can be converted into cash or branded merchandise. Those who make the first deposit will have it doubled up to €100 or currency equivalent, as long as they deposit at least €20. At the same time, they will collect 2500 seeds and the same number of loyalty points is credited to those who make a second deposit. This will only be matched by 50%, yet players have another opportunity of adding €100 to their account. Once these two steps are completed, players can continue with the accumulation of seeds by playing casino games on real cash. The process itself is exciting, as players embark on an epic quest, rather than grinding loyalty points one day after the other. Ikibu Casino is all about exploration and players earn more seeds when they reach a new village. These seeds can be harvested and exchanged according to the players wagering between camps. The best part is that seeds never expire so time is always on your side. There are a couple of restrictions that apply and wagering requirements to meet by those who receive bonuses. These are usually credited in five minutes after an eligible deposit was made and need to be played through at least 45 times unless otherwise stated. Different promotions have other wagering requirements and players need to stay up-to-date with the terms and conditions. Reload bonuses expire 30 days after being awarded and players don’t qualify for bonuses if they deposit via Skrill or Neteller. The contribution of various games towards clearing bonuses differs greatly, but slot machines count for 100%. There are hundreds of titles to choose from and all of them can be played on mobile devices. Piggy Riches, Zombies, Jack Hammer 2, Steam Tower, Muse: Wild inspiration, Victorious, Ghost pirates and High Society only have a 50% contribution towards the wagering requirements. Players should steer clear from Dr. Jekyll and Mr. Hyde, Lucky Angler, Bloodsuckers, Big Bang, The Wish Master, Devil’s Delight, Robin Hood, Tomb Raider 2, Tornado: Farm Escape, Dead or Alive, 1429 Uncharted Seas, Jackpot Jester 6000, Jackpot Jester Wild Nudge, Twin Spin, Reel Rush, Super Monopoly Money, Thunderstruck II, as they don’t help with clearing bonuses. Table games, video pokers and live casino games don’t count either. The popular Ikibu Casino payment methods include credit cards, electronic wallets such as Skrill and NETELLER. Trustly, Zimpler, Paysafecard, Euteller and Sofort are also offered and there are no fees or commissions applying to them. Credit card deposits are charged 2.5%, whereas electronic wallets and bank transfers are free from any fees. Players can deposit and gamble in EUR, USD, GBP, SEK and AUD and bonuses are offered in currency equivalent. A minimum withdrawal of €20 or its equivalent is expected from players who want to cash out their profits, while deposits of at least €10 are expected. Ikibu.com is an ambitious player in a very competitive industry. In this line of work reputation is everything and for a new gambling operator, they need to make a name for themselves. Being licensed and regulated by the authorities of Malta, it is owned and operated by MT SecureTrade Limited. They are also licensed by the United Kingdom Gambling Commission, one of the strictest regulating authorities. Keeping information of customers safe is the top priority at this online casino. That’s why they use the highly sophisticated secure socket layer data encryption technologies. The same algorithms are used by the leading financial institutions, so it is only fair to trust their ability to protect customers. Financial data is protected by the use of Payment Card Industry Data Security Standard security protocols and the casino is a strong advocate of responsible play and combats under age gambling. Ikibu Casino customer support is always at your disposal, with specialists working 24/7 to keep players happy. There are several communication options for those who need assistance, including live chat and email. The instant messaging service is currently used by most of those who seek a prompt answer and don’t mind direct interaction. The email has plenty of fans among those who prefer a lengthy letter and expect an equally detailed answer. Support is offered in English as well as several European languages. Ikibu Casino is the new kid on the block and one of the online casinos with big shoes to fill. It has the advantage of using the latest technologies and starting with a clean slate. They work under the management of Chance Hill, which is itself a new company founded in 2015. The upside is that they benefit from the knowledge and enthusiasm of a dedicated group of casino players. They know the industry inside out and this shows when looking at the collection of games and the bonuses they offer. Any Ikibu Casino review will highlight the fact that this is a place where gamblers feel like being a part of a grand adventure. It makes the most of a handful of role-playing game elements and offers an eclectic mix of classic and modern five reel video slots. The bonuses are easy to clear and generous enough as to appeal to new customers. The loyalty scheme is still in development, but the concept of exploration and the accumulation of exchangeable seeds show a lot of promise. - Ikibu Casino tells an original story and gets players hooked to this narrative. - This new casino is licensed by the UKGC and Maltese authorities. - A software developers provide games supervised by IBAS and eCOGRA. - Table games fans have fewer options and there are no bonuses for the live casino.